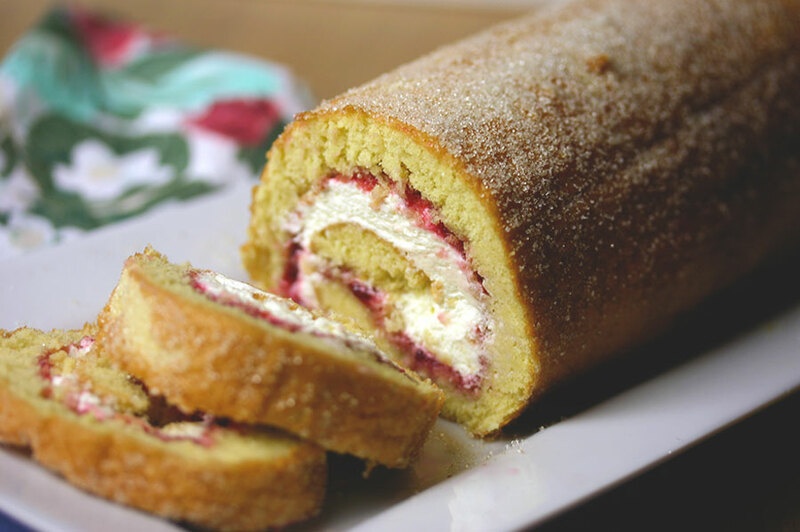 It took a few tries before I got the knack of making a Swiss roll, and could tick the next item on the Great British Bake-off signature bake list. Butter a 20×30 cm Swiss roll tin, and line with greaseproof paper. Whisk the eggs and sugar on high speed for a good five minutes until they are thick, light and foamy, and tripled in volume. Carefully fold in the flour and salt, then spread the mixture evenly in the prepared tin. While the sponge is baking, sprinkle a sheet of greaseproof paper with caster sugar. As soon as the sponge is cooked, flip it onto the paper and remove the tin. Make a shallow cut across one short end of the sponge, about 2cm from the edge. Gently roll the sponge from this end, and leave to cool completely on a wire rack. Carefully unroll the cooled sponge. Spread the surface with jam, stopping 4cm from the edges. Top the jam with whipped cream. Re-roll the filled sponge, sprinkle the top with sugar, and serve. That looks perfect? the size and the ‘coil’. Thanks for the tips. I meant to type : ‘That looks perfect!’ What a difference a punctuation mark can make… yikes!